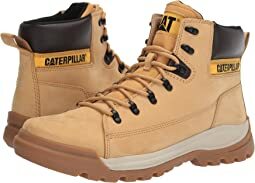 For nearly two decades, Cat® Footwear has been dedicated to designing quality footwear that lives up to the high standards and reputation customers have come to expect. 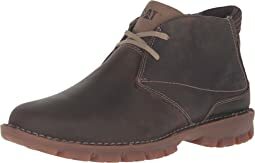 The brand originally began as a small collection of work boots designed to provide the worker with the comfort and durability to endure the jobsite. 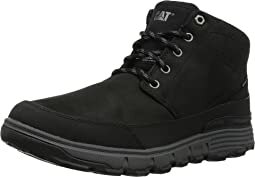 Today, Cat Footwear sells a wide range of footwear, from work boots to casual footwear, in more than 150 countries worldwide. Cat® Men's and Women’s Footwear Collection combines the rugged durability of a work shoe with the easy comfort of casual footwear. Using rich leathers, plush cushioning and durable construction, the brand offers authenticity and fashionable style for everyday wear. You will find a variety of men's and women’s boot styles in timeless, easy-to-wear silhouettes that will last for years to come. Embrace the legacy. Forged by work. Driven by life. I read the reviews of this boot before purchasing and was a little skeptical when I opened the box and compared them, sole to sole, against my favorite boot... they seemed about a half size larger so, I was a pleasantly surprised when they fit perfectly. I put both boots on, to try them out, and they felt great. I left them on all day and just forgot about them until I took them off that evening. The only thing that could make them better are tiny air-conditioners so I could wear them all year. I knew these Caterpillar's would run big so I planned ahead and ordered a full size smaller than my typical size. They fit well, still a tad big but my other pair are just a bit snug. I love the cushion and the fact that they have rubber soles to help me walk safely in wet weather. Size was fine. Great looking boot. Very comfortable. Very soft leather. Always considered this a brand for work only. Now my first stop for casual shoes too. These were comfortable right out of the box, just like my last Caterpillars. I like the style, but I wish they had some sort of toe guard. The fit is good, with a little extra room in the front half, but not enough to feel loose or sloppy. With heavy socks they would be snug. A bit pricey for my blood, but if they last as long as my other pair of Cats I'll be fine with it. What the hell has happened to so many shoe manufacturers, that they can't make a consistent, uniform size shoe anymore? 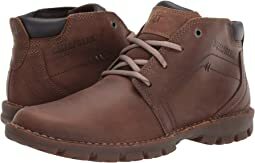 I first bought a pair of Columbia shoes the same size, and could barely get my foot in them. Hang in there Caterpillar. 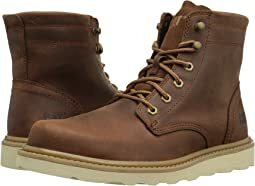 I ordered these boots along with several others for my husband to try out. He said these ones were literally one of the most comfortable shoes he's ever worn. He likes a soft/plusher foot bed. He literally wears them every day and they've been holding up well considering he is really hard on his shoes. I actually secretly ordered him another pair for Christmas in several months. It's always a bummer when your favorite shoes get worn out and they are no longer available. I normally wear a 10 and these feel slightly larger. Overall I like these boots. My biggest complaint would be that the color in the photo IS NOT the color of the shoe. Look online elsewhere - the true color is much lighter - more beige. The leather is also not very durable as it scuffs easily and I already have a small nick out of one shoe. So - why did I rate these a 4 star? 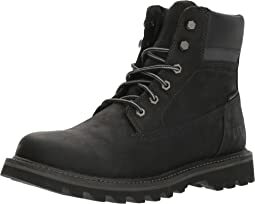 Got a great deal and for what I use them for - which is sloppy conditions when I'm only going to be out for a while and don't want to wear boots - these are great. They're comfortable. I rubbed some oil into them to get the color darker. They're pretty much my go to shoe when I don't want to worry about what shoe I have on. Super cute shoes with well-padded insoles, rubber outsoles, and good arch support, but only for you if you've got wider feet. I've got narrow heel so these really didn't work for me. They fit fine at the forefoot, but the back of my foot was sliding around side to side in the shoe. As I'm in the market for oxfords because I keep spraining my ankle and need more dressy flats, that was a deal breaker. I love these shoes so much. Having said that.. there's clearly a problem with manufacturing because the heel of the first pair I ordered was not attached, so I returned. Replacement pair arrived and the inner cushion was not properly glued to the shoe. Third time's the charm? Hope so... for $120 I'm going to return this pair and ask for a replacement. These shoes are poorly made -- the heel came apart almost immediately. Also the laces are cute but the leather won't stay tied without knotting. These shoes felt super comfortable right out of the box and thanks to the fabric insert have enough room across the widest part of the foot. The very stiff sole is a bit strange, though, and it curves up at the toes. They broke in pretty quickly and I was able to flatten out the curved soles enough to make walking in them feel fine. They are very cute, although the chunky suede laces aren't top my taste and I will probably replace them. With the Vibram Arctic Grip sole, these boots do help with slipping on wet ice. It's still important to be cautious on ice/snow, though. They are a bit long, but fit well with thick wintery socks. 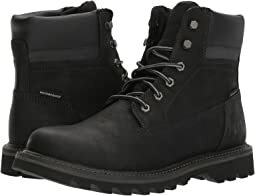 They are waterproof and comfortable for walking in snowy/icy conditions, like for running errands with snowy parking lots, short walks so the dog doesn't get cabin fever, using the snow blower, etc. These are so cute! The twead really makes these special. The shoes are super cute! I have always been a size 8.5 and with some of the reviews I was thinking of a larger size. I ended up ordering 8.5 and checking the size a few times since the shoes were too big for me. Im not sure if I should try again and order 6.5 or 7. Love these shoes! One can definitely dress them up or down. They feel sturdy with the non slip outsole. Best of all the fit is perfect. I ordered a size 5 1/2 and it fits perfectly. No need to break them in, comfortable right out of the box. Worst fitting shoe I've ever worn. Brought these for my teen as a waterproof shoe. So far, he really likes them - very comfortable and seem true to size. He usually wears an 11 in athletic shoes and the 11 fits. Might run a tiny bit on the big side if anything, but probably no need to size up/down on these. They seem to be well made-time will tell. I hope they truly are waterproof as listed.. will try to update review once we know for sure. I wear a 10.5 wide and these fit perfectly. 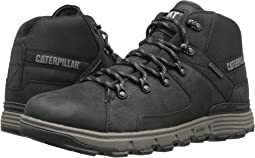 The last for Catepillar shoes seems to run consistent with 10.5 rather than a 10. For this I am happy! 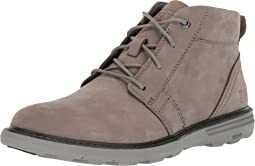 This is nice casual to work shoe that will be perfect with my teacher outfits. Thanks as always for great service Zappos! The fit and the size were perfect. The shoe is very comfortable. I have worn them all day at work and I do a lot of walking. 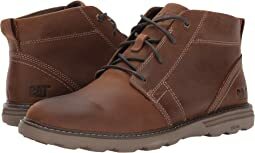 These shoes are stylish and they look good with jeans or nice pants. 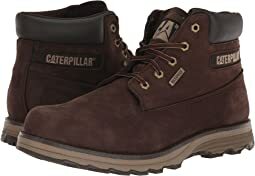 I have never purchased the Caterpillar brand shoes before but I am so satisfied with them that I will definitely be considering this brand again for future purchases. 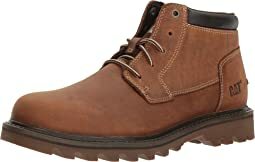 these boots are very hard to get your foot into with a tight neck opening. gave them away. 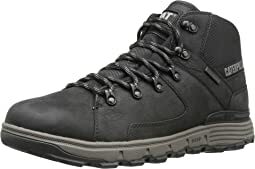 Nice boot, super comfy, rugged, and pretty darn waterproof from what I can tell. Also, it looks pretty stylish, in my opinion. I recommend it. 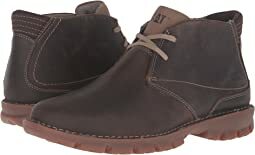 I needed new loafers and bought these in brown. I love the tweed accent, and they were incredibly comfortable. However, since I will be mostly wearing them to work, they seemed too casual to keep. They're kind of rustic, even if you were to swap out the suede laces. I had to re-oreder hals size smaller. Love the style. Well constructed. I recommend buying this shoes. Comfortable on the toes, shoes are not too pointy, not to round.